The practical need to partition the world of viruses into distinguishable, universally agreed upon entities is the ultimate justification for developing a virus classification system. 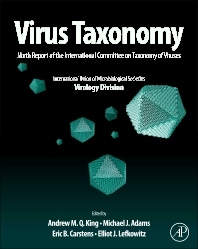 Since 1971, the International Committee on Taxonomy of Viruses (ICTV) operating on behalf of the world community of virologists has taken on the task of developing a single, universal taxonomic scheme for all viruses infecting animals (vertebrate, invertebrates, and protozoa), plants (higher plants and algae), fungi, bacteria, and archaea. The current report builds on the accumulated taxonomic construction of the eight previous reports dating back to 1971 and records the proceedings of the Committee since publication of the last report in 2005. Representing the work of more than 500 virologists worldwide, this report is the authoritative reference for virus organization, distinction, and structure.